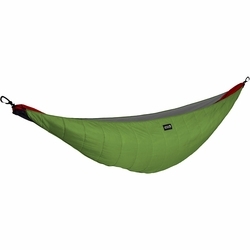 ENO Ember 2 UnderQuilt. Hammock-camping is now a four-season game, and with the Ember 2, it doesn't have to break the budget. The most affordable hammock underquilt on the market, the polyester-filled Ember 2 surrounds the sides and bottom of your hammock with a hammock specific cut, protecting you from winter's nastiness. An adjustable shock cord at each end speed up setup, meaning less time freezing and more time enjoying nestled, toasty goodness. Eagles Nest Outfitters.